"Spring" Ahead With The 50/50 Cleanse! — Sandy Joy Weston M.Ed. 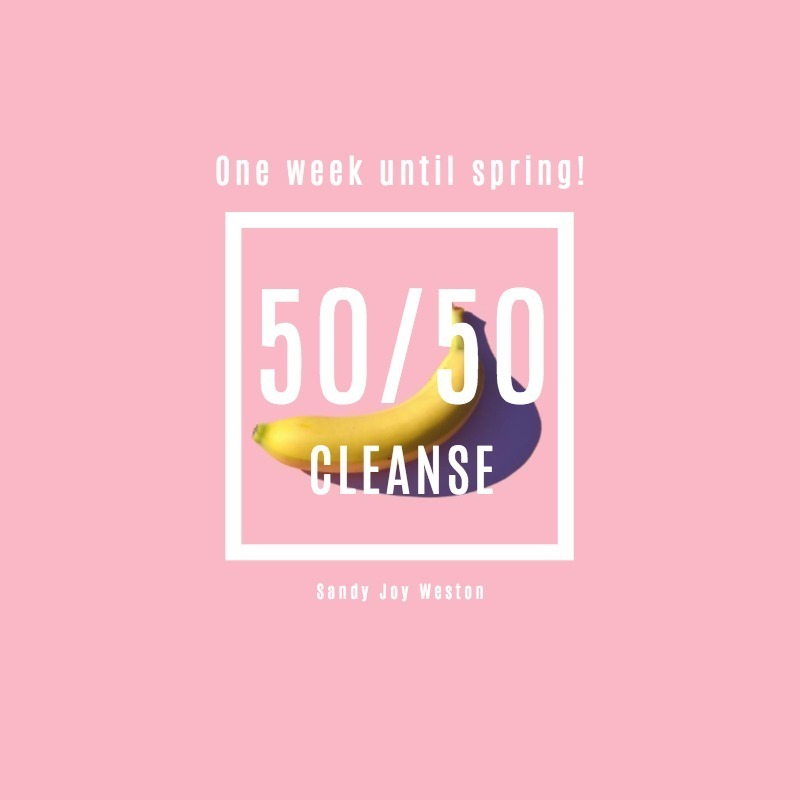 "Spring" Ahead With The 50/50 Cleanse! Hey gang - it is exactly one week until spring...but we are not waiting! We are going to “spring” ahead & start now. It is called the 50/50 cleanse. It is very simple...what you are going to do is list 3-5 things that you eat or drink that you and I both know do not serve you well OR...that would, but in moderation. Total up how much you have a week and just cut it in half...we are not cutting it out, just cutting in half, starting today. Come on people - cold turkey doesn't work! I am a true believer in gradual change. Most people’s top 5 are usually: sweets, bread, alcohol, caffeine & fried food. For me and my personal journey, with all the great things happening with the book, I am celebrating a bit too much and overdoing it with red wine, coffee & appetizers like flatbreads. Now all these are good...but in moderation! The point is, for example, if you have 4 cups of coffee a day...now you are doing two. Including weekends! What are your top 5? Let’s hold each other accountable & write it down. Now, think about the top 5 things that you enjoy and love to eat that serve you well - for me with my wine and coffee I want to replace them with warm decaf tea & club soda. For my appetizers, most times I will just pass or have a cup of soup or hummus and veggies. Use the hashtag and comment what your #mytop5 is. Let's get the spring off to a great, early start.